My recent Beyond Boundaries column for The Psychologist explores how the micro-culture of Colombian paramilitary organisations may have shaped the expression of post-traumatic stress disorder in demobilised fighters. “The Psychologist is sent free to all members of the British Psychological Society (you can join here), or you can subscribe as a non-member by going here. Link to column from The Psychologist (bottom of page). I just found this fascinating account of how Vincent Van Gogh cut off his own ear while seemingly severely mentally ill, the event that led him to paint one of his most famous pictures. The account is apparently reconstructed from known events at the time but also has van Gogh’s own description of the event, taken from letters to his sister. On Christmas Eve 1888, after Gauguin already had announced he would leave, van Gogh suddenly threw a glass of absinthe in Gauguin’s face, then was brought home and put to bed by his companion. A bizarre sequence of events ensued. When Gauguin left their house, van Gogh followed and approached him with an open razor, was repelled, went home, and cut off part of his left earlobe, which he then presented to Rachel, his favorite prostitute. Although absinthe is commonly associated with hallucinations and madness, and the author of the article wonders whether it might have helped cause his epilepsy, this is unlikely due to the fact that the effect of absinthe’s ‘special ingredient’ is largely a myth. The distinctive aspect of the drink, the chemical thujone from the wordwood plant, is actually present in such small quantities that absinthe has virtually no psychoactive effects beyond the alcohol. However, epilepsy does raise the risk of psychosis and it is suspected that he had temporal lobe epilepsy which is particularly associated with this reality-bending mental state. Link to AJP article on ‘The Illness of Vincent van Gogh’. I’ve just finished this book, and yet I still couldn’t tell you what it was trying to claim. 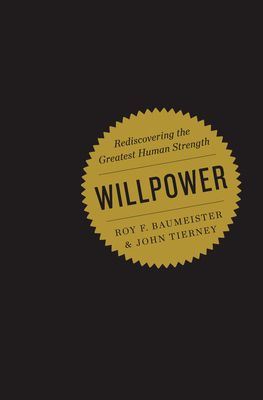 It’s a grab-bag of research on willpower, nearly all of it done by social psychologist Baumeister and colleagues, and including his celebrated experiments on ego-depletion. The ego-depletion experiments appear to show that willpower is a limited resource dependent on blood sugar. Using it to control your impulses diminishes it in the short-term, but can build it up – like a muscle – in the long term. Ultimately, however, this book presents this set of findings with little to offer in terms of coherent insight. The advice given for our daily lives is glib and unhelpful. The reader is told, for example, that to avoid smirking at an idiotic boss in a meeting, we should avoid strenuous mental work beforehand (p27). As if we all have the liberty of avoiding strenuous mental work whenever we want! Being told not to be tired sort of begs the question, in my opinion, and in self-help terms is about as useful as being told to “be clever” or “have great ideas”. …Annoying isn’t it? The references to events and celebrities who have temporarily floated to the surface of the toilet bowl of American popular culture will make this book date very badly in the next few years (and already meant that this, admittedly sheltered, British reader had to use wikipedia to work out who was being talked about in some chapters). I’m guessing that science journalist Tierney wrote this book, with advice from Baumeister (an impression fostered by the authors’ insistence on talking about themselves in the third person, which is disorienting). Even so, some of the psychological clangers are inexcusable and would shame an undergraduate (for example, squirrels burying nuts for later are dismissed as following “programmed behaviours, not conscious saving plans” (p15). To make this assertion gives the impression that we know both what a squirrel is thinking and what the nature of a conscious saving plan is (we don’t). To arbitrarily dismiss the highly flexible and foresightful behaviour of the squirrel as merely “programmed” prevents you, at one stroke, from understanding properly the role of automatic mental processes in our own future-orientated behaviour). The examples of sexism, on the other hand, are at least so blatant that they can be enjoyed for the full force of their anachronistic misogyny. (p56 tells us “most women cope quite well with PMS at work”, which has a lovely quality of being superficially positive, whilst implying that actually we should expect many women not to be able to cope, especially at work, and even those who do only manage to do it “quite well”.). The references to the literature are patchy, making it frustrating if you want to check the source for some of the authors’ most interesting claims. Overall this book is a great disappointment. Roy Baumeister is one of the most exciting social psychologists, managing to do experimental work which addresses fundamental issues of what it means to be human. This book, on the other hand, is an example of how sterile experimental psychology can be when faced with the complexities of a core human dilemma, such as that of self-control. Although it is written in a breezy style, it never really grips the attention like the books of Malcolm Gladwell (which it obviously aspires to emulate). Because the treatment of the psychological evidence is superficial, and it never gives a full account of exactly what theoretical position they are trying to argue for or against, the book is scientifically unsatisfying. The other flaws I’ve discussed above make it, overall, an annoying book to read. If you want a self-help book with an appreciation of the psychology of willpower, read Dave Allen’s Getting Things Done. If you want an entertaining and accessible account of the science of volition read Dan Wegner’s The Illusion of Conscious Will. If you want an account of self-control with a genuine appreciation of the nuances of the human condition try George Ainslie’s Breakdown of Will. This book will satisfy none of these needs. The Guardian covers a new study on how video games can persist in our perception as fleeting hallucinations in an effect labelled ‘game transfer phenomena’. “The academic literature goes back to 1993,” says Griffiths. “There was a case of a woman who had auditory hallucinations; she just couldn’t get the tune of the game she was playing out of her head – it was very intrusive. But what came out of our pilot research were lots of different experiences, some that were auditory, some visual and some were tactile. We had the example of a teacher who dropped his pen and immediately reached for a joypad button to retrieve it, as though he were in a game. Needless to say, the tabloids got carried away and ran with ‘gamers losing touch with reality’-type stories although it sounds like the authors of the study were probably a little over-enthusiastic with their own descriptions. Despite this, it sounds like an interesting study describing how conditioned responses and perceptual expectations learnt in video games might be get triggered in other situations. I knew someone would get round to studying those weird thoughts about Tomb Raider at some point. National Geographic has an excellent article on teenage risk-taking and adolescent brain development. It goes some way to explaining both the dangerous mistakes that typically peak in the late teens and, I like to think, the bad fashion sense which seems to follow a similar pattern. Importantly, the piece goes beyond the usually ‘well the frontal lobes are still developing, aren’t they?’ explanation that gets wheeled out whenever teen neuroscience is discussed and hits on some of the gritty details. Are these kids just being stupid? That’s the conventional explanation: They’re not thinking, or by the work-in-progress model, their puny developing brains fail them. So if teens think as well as adults do and recognize risk just as well, why do they take more chances? Here, as elsewhere, the problem lies less in what teens lack compared with adults than in what they have more of. Teens take more risks not because they don’t understand the dangers but because they weigh risk versus reward differently: In situations where risk can get them something they want, they value the reward more heavily than adults do. Probably one of the most comprehensive introductions to teen risk you’ll read in a good while. Link to National Gerographic on Teenage Brains.